The shifting place of fantasy within contemporary animation allows us to make some preliminary discriminations about how fantasy’s own icons and images function in relation to the shaping of Hollywood studios and their brand identity. The continued business strength of the U.S. animation industry in the post-millennial period thanks to Pixar Animation Studios, DreamWorks Animation and Blue Sky - as well as the parallel renaissance of Disney Feature Animation - has provided a growing number of critically and commercially successful test cases that showcase where fantasy does (and does not) appear in popular animated media, but also how fantasy has become a default and highly durable viewing strategy utilised by audiences in determining the precise terms of studio authorship. Clearly fantasy exists outside ‘in the world’ as a culturally established set of principles thanks to the historical connections between fantasy and animation, coalescing into a spectatorial framework that comes to bear on how audiences engage with mainstream animated features. My own chapter for Fantasy/Animation: Connections Between Media, Mediums and Genres sought to wrestle with the cultural and industrial ‘work’ of fantasy/animation, bringing together the narratives and style of contemporary computer-animated films with fantasy film theory as a way of unlocking how the animated fantasy is culturally understood within the North American filmmaking context. The acquisition of Pixar by Disney in 2006 (alongside their often contradictory relationship as competing, exclusive, and yet in many ways fully entwined studios over the two decades more broadly) provided a particular example of how audiences are able to bring an understanding of studio brand identity to the cinema auditorium, and in doing so utilise fantasy to qualify the suitability of narrative material available/not available to specific animation studios. Walt Disney’s historical connection to traditions of fantasy storytelling remains, of course, a well-trodden rather than newly-forged critical path, one whose narrative does much to consolidate the split between fantasy as a set of tried-and-tested archetypes supporting ‘content’ that are then actualised or ‘coloured’ into being by the creativity of the animated medium . It is certainly not hard to find evidence of the Disney studio’s ongoing affiliation with animated fantasy, not least when we look to the wealth of publications central to the emergence and subsequent consolidation of something closely resembling a unified ‘Disney Studies’ in the mid-1990s. More recent book-length studies of Disney animation by Amy M. Davis (2006; 2013) and Chris Pallant (2011) offer close examinations of the studio’s animated features largely along the fault lines of style, form and meaning. Ten years previous, however, edited anthologies such as Disney Discourse: Producing the Magic Kingdom (1994) and From Mouse to Mermaid: The Politics of Film, Gender, and Culture (1995), as well as other writing by Eleanor Byrne and Martin McQuillan (1999) and Annalee R. Ward (2002), first picked up the ideological slack within animation studies with fervour, yet did so through the preservation of fantasy as Disney animation’s lingua franca. The persistent placement of fantasy firmly within the political structures of the Disney studio - including most securely amid its animated feature films - has led to common associations between how Disney makes its magic but also the significance or politics of the magic itself. As Janet Wasko puts it in Understanding Disney: The Manufacture of Fantasy, the many activities undertaken by the Disney corporation, from merchandising (home video) and television to theme parks throughout the nineties (the “Disney Decade” as the company’s promotional material labelled it) all helped to corroborate “the allure of Disney’s brand of fantasy” (1998: 30). What is perhaps interesting here, as Jack Zipes argues in his chapter from From Mouse to Mermaid titled “Breaking the Spell,” is that Disney sits in a long line of animated fantasy storytelling that begins in earnest with Georges Méliès, who as we argue in the Fantasy/Animation collection might ultimately be considered the father of ‘fantasy/animation’ per se. Zipes notes that the French filmmaker “began experimenting as early as 1896 with types of fantasy and fairy-tale motifs in his féerie [stories with fantasy plots] or trick films” (1995: 28). Striking here is the suggestion that, again like Disney animation many years later, the successful execution of fantasy requires a turn to the techniques of animation. Motifs necessitate the medium, and so for Méliès animation provided the perfect way to visually articulate the language of fantasy and fairy-tale. Fig. 2 - Wreck-It Ralph (Rich Moore, 2012). Fig. 3 - Brave (Brenda Chapman & Mark Andrews, 2012). More recent entries into Disney Studies, such as Joseph Zornado’s book Disney and the Dialectic of Desire: Fantasy as Social Practice (London: Palgrave Macmillan, 2017) make even clearer the centrality of forms of fantasy to the machinations of Disney animation. Drawing from Lacanian psychoanalysis as a way of explicating how Walt “bet his entire career on a fairy tale production” (2017: 2), Zornado goes on to coin the specific idea of “Disney fantasy” to describe the studio (including predominantly its animated features) as “purveyors of fantasy with a history that offers itself as a kind of proto-myth of fantasy with which Americans are encouraged to identify themselves” (2017: 105, emphasis in original). It is interesting, too, that Zornado’s book includes a chapter title “Disney, Pixar, and Neoliberal Nostalgia”, in which he argues that the acquisition of Pixar by Disney in 2006 “can only be fully appreciated within a larger historical context, which includes an understanding of Disney animation, Walt Disney himself, and the rise of Disney fantasy” (185, emphasis in original). However, the fluency between Disney and Pixar as corporate bedfellows following the announcement of their 2006 merger opens up as many critical avenues as it closes. On the one hand, it is interesting to see how Pixar might be seen to continue the neo-conservative ideologies and pervasive structures of fantasy of its parent company. Lee Artz has suggested in no uncertain terms that Disney’s more recent computer-animated films (that he, like Pallant, fit under the “Digital Disney” banner) actually “advances the same ideological content” as more classic (and presumably more ‘typical’) Disney films of the 1940s and 1950s (qtd. in Giroux and Pollock 2010: 114). On the other, the often contradictory relationship that Pixar holds with Disney can be made sense of - or at least given greater nuance - through the very absence of fantasy within its feature films. Or, perhaps, how fantasy can belong to Disney and to Pixar in different ways, and that any co-option of supposedly typical Disney fantasy elements by Pixar tells us about the cultural and industrial role of (certain kinds of) fantasy within contemporary Hollywood animation. As I seek to explain in the Fantasy/Animation chapter, the almost simultaneous release of Disney’s Wreck-It Ralph (Rich Moore, 2012) (Fig. 2) and Pixar’s Brave (Brenda Chapman & Mark Andrews, 2012) (Fig. 3) raised questions as to the porosity between the two studios in the post-merger period. Critical and popular discourse attempted to expose with a degree of certainty that Disney and Pixar had momentarily exchanged identities to produce films under the other’s name, with Brave playing out like a classic Disney fairytale while Wreck-It Ralph evoking memories of Woody and Buzz in its narrative of videogame characters come-to-life. Despite Artz’s initial claim for ideological continuity, Pixar outwardly had up to this point staked out very different territory to Disney animation in its computer-animated feature films. 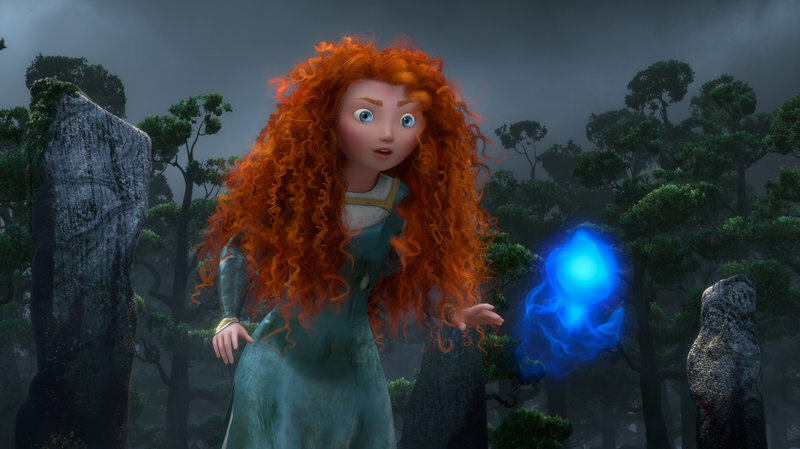 If “Disney films tend to inhabit the world of fantasy” (Booker 2010: 44), then Pixar’s sudden appearance in this same space with Brave and its narrative set in the Scottish Highlands set alarm bells ringing. Fantasy was something that belonged to Disney and its animated features, and yet here it was seemingly borrowed (without clear citation) and flagrantly paraded under the Pixar name. Zornado argues that “Fantasy, like language, is a Trojan horse - it seems like an innocent gift, but its contents are designed to seize authority over the subject’s desire and install the values and ideologies that support and sustain neoliberal culture” (2017: 185). Given the problematic reception of Wreck-It Ralph and Brave as faux-Disney and faux-Pixar films respectively, the relationship between fantasy and animation works in a similarly covert manner, pointing to the smuggling of a specific mode of fantasy under the guise of an “innocent gift”. Yet the introduction of fantasy film and literary theory to these encompassing debates within my chapter attempted to shine a light on the terms of this alleged industrial deception that was easily picked up by audiences well-versed in the codes and conventions of fantasy storytelling, if not Disney and Pixar’s brand image. However, it is only when thinking through the fantastic elements of Wreck-It Ralph and Brave that it becomes clear each film’s authenticity remains intact, revealing that the truth of Pixar’s plundering of Disney’s fantasy template is a misnomer when, instead, it’s narrative is more in line with the fantasy of Toy Story (John Lasseter, 1995) than it is with Snow White and the Seven Dwarfs (David Hand, 1937) or Cinderella (Clyde Geronimi, Hamilton Luske & Wilfred Jackson, 1950). Fig.4 - Coco (Lee Unkrich, 2017). Released sadly too late for its inclusion in Fantasy/Animation, Pixar’s recent feature Coco (Lee Unkrich, 2017) has seemingly reopened the question of who can ‘do fantasy’ (Fig. 4) within the context of contemporary Hollywood. The film marks perhaps Pixar’s fullest engagement with a Disney-style arrangement of fantasy (if such a thing exists), and although the film garnered more attention for its cultural sensitivity (or lack thereof) in its portrayal of the Día de Los Muertos festival in the Santa Cecilia region of Mexico rather than its appropriation of ‘Disney-ness,’ Coco nonetheless invites further interrogation concerning its turn to fantasy spaces, vibrant magic kingdoms and myth. Part-musical, part-fantasy, all-animation, Coco is certainly unlike the fantasy of sentient automobiles that returned for a third time in Pixar’s earlier release that year, Cars 3 (Brian Fee, 2017). It is also very different in tone to the wealth of other computer-animated films that steadily arrived in theatres throughout 2017 from U.S. studios alone, including The Emoji Movie (Tony Leondis, 2017), Despicable Me 3 (Pierre Coffin & Kyle Balda, 2017), The LEGO Batman Movie (Chris McKay, 2017), The Boss Baby (Tom McGrath, 2017), Ferdinand (Carlos Saldanha, 2017) and Captain Underpants: The First Epic Movie (David Soren, 2017) amongst others. But in the case if Pixar, if both Cars 3 and Coco operate according to what are broadly speaking fantastical plots rooted in wondrous impossibility, then Unkrich’s film instead uses distinctions between ‘above’ and ‘below’ to articulate the split between reality and fantasy, grounding its colourful fantasies to specific real-world geography. The Día de Los Muertos that takes place on the streets of Santa Cecilia becomes a way to authenticate the real-world fantasy of ritual ‘up top’, while the corresponding and richly textured Land of the Dead is the playful antithesis and a place where fantasy runs riot in a carnivalesque celebration ‘down below’. The collision between these two worlds is channelled through 12-year-old protagonist Miguel, whose movement (and, later, performance, as a ‘dead’ character) allows Coco to explore animation’s very own register of life and its illusion. Yet its narrative of magic and spirit guides offers up some potentially points of continuity with the formula for Disney fantasy that are worth exploring further still. Perhaps unlike Brave, it is Coco that marks the moment where Disney/Pixar have truly come together. Bell, Elizabeth, Lynda Haas and Laura Sells. From Mouse to Mermaid: The Politics of Film, Gender, and Culture (Bloomington, IN: Indiana University Press, 1995). Booker, M. Keith. Disney, Pixar, and the Hidden Messages of Children's Films (Santa Barbara, California: Praeger. 2010). Byrne, Eleanor, and Martin McQuillan. Deconstructing Disney (London: Pluto Press, 1999). Davis, Amy M. Good Girls & Wicked Witches: Women in Disney’s Feature Animation (John Libbey & Company/University of Indiana Press, 2006). ———. Handsome Heroes & Vile Villains: Men in Disney’s Feature Animation (John Libbey & Company/University of Indiana Press, 2013). Giroux, Henry A. and Grace Pollock. The Mouse that Roared: Disney and the End of Innocence (Lanham: Rowman & Littlefield Publishers, Inc. 2010). Pallant, Chris. Demystifying Disney: A History of Disney Feature Animation (London: Bloomsbury Academic, 2011). Smoodin, Eric, ed. Disney Discourse: Producing the Magic Kingdom (London and New York: Routledge, 1994). Ward, Annalee. Mouse Morality: The Rhetoric of Disney Animated Film (Austin, TX: University of Texas Press, 2002).